The sensing mechanism is a chemiresistor approach: nanofiber sensors change electrical resistance in response to changes in a proximate chemical environment. The nanofibers form a net or porous structure across an electrode pair resulting in a large surface area that specifically “captures” targeted molecules from the gas phase samples through molecular diffusion and surface adsorption. When the nanofibers capture target molecules, they will either withdraw electrons from the molecule or donate electrons to it, resulting in an increase or decrease in observed current. Response times for detection are then measured in seconds, not minutes. Over eighty fibers have been developed to date. Each one responds differently to a chemical or chemical class. When the nanofiber sensors are combined into an array, their combined responses form a unique signature or fingerprint for each target chemical. Furthermore, an essentially unlimited number of nanofibers can be developed leading to improved selectivity and sensitivity for a broadening range of target analytes. Using nanofibers as chemiresistor sensors can overcome previous limitations of other chemical sensor technologies in terms of humidity, temperature, recovery time, selectivity, and sensitivity. A representative from the Vaporsens Team will respond to you shortly. Thank you! Nanofibers are prepared from building block molecules (based on a perylene core molecule) with functionally unique side groups. These building block molecules are then self-assembled into nanofibers. Nanofibers are then coated onto nano-scale electrode pairs configured as interdigitated electrodes (IDEs). Because nanofibers are conductive, they complete an electrical circuit when coated onto IDEs. Because a nanofiber can be approximately one thousand times smaller than a human hair, the large porous surface area of nanofiber coatings provide optimal absorption of chemical vapors that can result in sensitivity in the parts per billion range for most target compounds and in the parts per trillion range for some chemicals, such as RDX and TNT. The selectivity of Vaporsens nanofibers starts with the design of the molecules that form the nanofibers. The head group of the molecules that form nanofibers are selected to capitalize on three degrees of freedom that affect the sensing mechanism and to tune selectivity: physical, thermodynamic and kinetic. All other types of chemical sensors typical use only one of these three sensing mechanisms. However, nanofiber sensors take advantage of all three mechanism simultaneously and are far superior to other chemical sensor types in terms of selectivity. Because nanofibers are engineered to be highly reactive with targeted chemical analytes, the charge transfer between nanofibers and chemical gases is detected very rapidly, typically in less than 5 seconds. Response speeds can vary slightly as a function of the chemical species and its concentration. Because molecules stabilize very quickly with free electrons in the nanofiber environment, sensor recovery time is also very fast. Low power is applied in the form of a small bias voltage through the nanofibers coated onto interdigitated electrodes (IDEs). The bias voltage generates an electrical current that flows through the nanofibers. When the nanofibers are exposed to a chemical, charge transfer events occur between the nanofibers and the target chemicals. The charge transfer events lead to a change in conductivity that produces a signal indicating detection of a chemical. Because the bias voltage and currents are both small, only very low power is required to operate a nanofiber sensor. Currently, the entire 16-sensor array and associated hardware are powered through a micro-USB port. Future devices will be battery-powered. Over eighty nanofibers have been developed to date. Each one responds differently to chemicals such as TNT, ammonia, or formaldehyde. When different nanofiber chemical sensors are combined into an array, their combined responses form a unique signature pattern for each target chemical. Arrays can also be engineered for detecting dissimilar chemical targets. Current Vaporsens devices utilize a 16 nanofiber array, allowing for trillions of unique chemical signatures and very high selectivity. 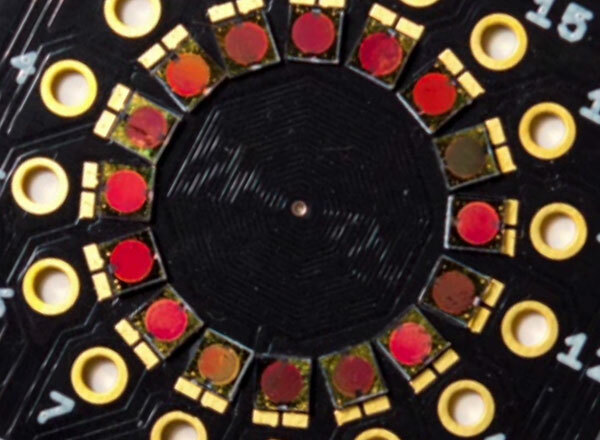 Because there are 16 fibers in one array, the sensors can also be optimized to target a single chemical in the presence of other chemicals or multiple chemical analytes simultaneously. Best results for multi-target sensors are achieved when chemicals are within the same chemical family. Due to the miniature size of nanofiber chemical sensors, they can be embedded into very small devices. Each nanofiber sensor chip is approximately 3 mm square. The size of the detector arrays can be as small 5 cm square. 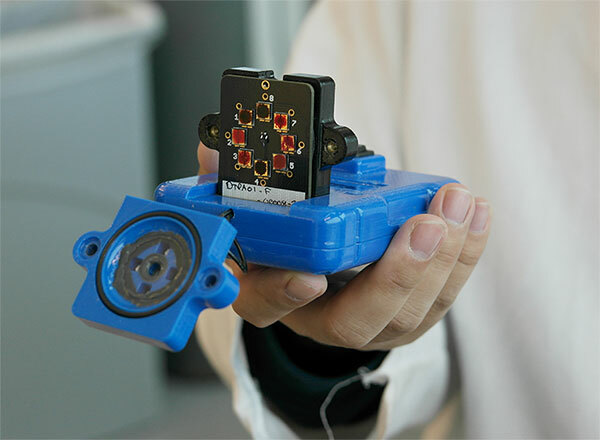 Detection electronics can also be miniaturized and operated on battery power. Thus, nanofiber chemical sensor technology can be used in extremely portable, handheld and wearable devices.